Our Motorhome Insurance cover level now comes with our new 3-year Fixed Price Promise. This means you'll know exactly how much your car insurance is going to cost for the next two renewals, as long as nothing changes on your policy. 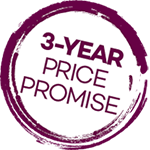 With our price promise you aren't tied you in for three years – we’ll send you your renewal documents after a year and whether or not you choose to stay with us is entirely up to you. To see how much you could pay for your next three years’ insurance get a quote now. Benefit from Legal Protection to help you recover uninsured losses after an accident that’s not your fault. We also offer another level of cover, Essential Insurance, to see how our two Comprehensive cover levels compare click on our Motorhome insurance cover options below. Accident Healthcare cover – we’ll provide you and your spouse/partner with eligible private medical treatment if you’re injured in a road traffic accident. Saga's range of insurance products is designed specifically for our customers and is unique to us. Saga Motorhome Insurance is provided by Acromas Insurance Company Limited which meets our high standards of quality and service.